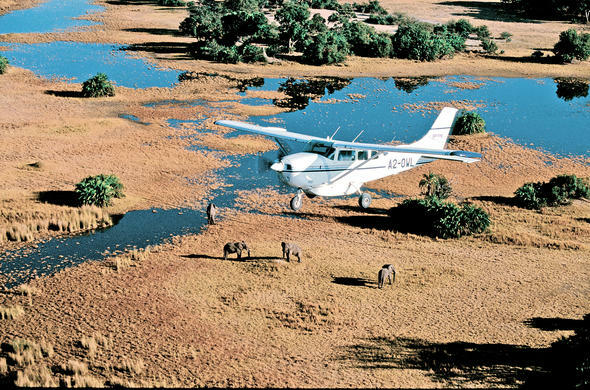 The Okavango Delta is the most dynamic ecosystem on the planet, with the landscape in a state of constant change from the workings of particular animals that inhabit the land. The Okavango Delta, a place of constant change, is the last resort of a once-great lake that was fed by the flow of mighty rivers such as the Zambezi. As the great Zambezi shifted course the great lake began to shrink and today the delta is all that is left of the great water body. Signs that more often than not go unnoticed in the vast northern Botswana wilderness indicate the shrinking and constant changing of the delta over the years. Relics of floodplains of the past are sprawled across the mostly-uninhabited northern wilderness. It is difficult to imagine any time so dry that the permanent areas of the Okavango dried up, but the presence of termite mounds in the permanent delta areas indicate a time when the delta was dry - a time of extended drought when the floodwaters failed for a number of seasons. The Okavango Delta does not rest. It is a place that is been reshaped every moment of the day. Hippos cut new paths, blocking others through a build-up of earth and vegetation in the old channels. Floodwaters are not forceful enough to push these blockages aside - the waters will simply flow around them, creating new channels. Over time detritus will build up against a blockage and as the seasons pass the build up may become sufficient enough to form a small island - which will expand over the years. Termites are responsible for more physical changes to the landscape of the delta than anything else. With the first rains millions of termites will be released from the colonies. Most of these termites will be eaten by birds and other creatures but many will survive and find suitable mates - which will then unite to build new colonies across the delta. A question that is often asked is how the termites manage to build such large structures in a flooded water waterway. The answer to this lies in the seasons. When the rains arrive, and the termites are released, the delta is at its lowest levels. The floodplains are dry allowing the termites' time to construct a suitable waterproof structure before the arrival of the floodwaters. Regular visitors to the Okavango will notice changes happening over the years due to the work of the hippos and termites, but this does not detract from the experience that this pristine wilderness ensure the visitor.